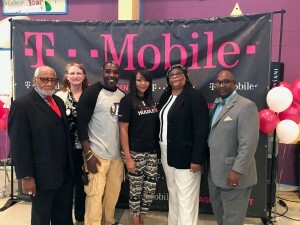 T-Mobile Huddle Up Revitalizes Destiny Achievers Academy of Excellence. Media Giant Begins Massive School Make-over. When you walk through the halls of Destiny Achievers Academy of Excellence (DAAOE) in Ellenwood, you quickly realize it’s not your typical school, but today the halls are filled with the pitter-patter of the feet of more than 150 Atlanta area T-Mobile and Metro PCS employees. Through City Year, an Atlanta based non-profit bridging the gap in high-poverty communities between the support students need, and what their schools are able to provide. Working together, T-Mobile employees transform schools from dull to dynamic with makeovers and updates to the school’s science rooms; painting murals along the hallways; beautifying the school cafeteria; revamping the school entrance; and painting tech and storage rooms. According to Monica Brown, Director, Enterprise Delivery Management, “T-Mobile is pleased to assist deserving schools with much needed renovations. Supporting our community and investing in our youth are two of our greatest commitments.” On-hand for this unprecedented revitalization, were key elected officials, community activist, local clergy, students, and representatives from DeKalb County Schools including Laura Stowell, Director of Charter Schools/School Governance; DeKalb County Commissioner Gregory Adams, District 7; and DAAOE Board Chair and Vice-Chair Wilbert Dixon and Roschelle Hudson. Now in its 12th year, T-Mobile Huddle Up has transformed more than 110 schools nationwide. The community is encouraged to join in the revitalization efforts throughout the weekend and the media is encouraged to stop-in for interviews and guided tours. T-Mobile Huddle Up is designed to help local schools by improving their environment and providing resources, through a community centered, engagement approach. For more information on Destiny Achievers Academy of Excellence, please visit www.daaoe.org. *Editor’s Note: This is the official media release provided by T-Mobile (written by Lorraine Cochran-Johnson).